You are here: Home | Computer Repair / Maintenance | Hard Drive Space vs. RAM: What's the Difference? Hard Drive Space vs. RAM: What’s the Difference? If you’re in any kind of computer field, you most certainly know the difference between RAM and hard disk drive (HDD) space. However, the older generation (i.e. your parents and grandparents) that are using computers often don’t know the difference. Many people that know me know that I work with computers and they will either ask for my advice, or ask me to look at their computers. When I ask what is happening with their computer, they’ll start the conversation with something like “My Computer Is Slow! I don’t know why either.. I have 500GB of memory.” Unfortunately, this is common among older computer users and the reason I am posting this article. In the next few sections, I will present an analogy that should help ease the confusion. The best way I can explain to a person the difference between a HDD and RAM is to say that your HDD is like a filing cabinet. Inside the hard drive all of your MP3s, text documents, and pictures are stored in files which the computer user the organizes in a way that’s convenient to them. You can have as many (or as few) files in your cabinet that you wish. If you look at the graphical representation on most computers, each directory that stores your grouped files has a file folder icon. This is synonymous to a filing cabinet’s hanging file folders. These folders in your filing cabinet organize your files into related groups for easy access. Normally, having many files in your hard drive does not slow down your computer. (There may be exceptions to this, see “Defragmentation” below). 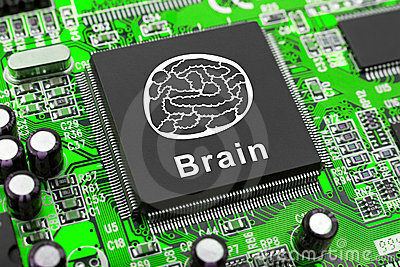 When thinking about your computer, it helps to think of the Central Processing Unit (CPU) as your computer’s brain. It handles all of the processing for every function and process that the computer is performing every second that is powered on. The more processes that you are performing (listening to music while sending emails and chatting online at the same time, for example) the more your brain is working, and the slower the computer performs. This is where RAM comes in. Many video cards have RAM built into them to aid in speeding up your computer by offsetting the CPU’s (and your installed RAM’s) burden by processing any video related requests. If your computer is running slower than normal and your system is at its maximum capacity for RAM, you may want to consider adding a video card with on-board RAM to aid in speeding up your system. The process of defragmenting your hard drive. Is an older concept that doesn’t really apply to the average computer user today (although there is still much debate on this issue). This was more common in older computers that had a very small hard drive capacity. Computer hard drives do not store information in a linear fashion, which is a very common assumption. Hard drives write information to your hard drive in any available space it finds and links the “pieces” of each file together to form one file. When you delete information from the hard drive, “fragments” are left behind in the spaces in which the deleted file used to reside. The process of “defragging” is a process where your computer analyzes your hard drive and removes these blank spaces (fragments) that have appeared due to the removal of files. Unless you are deleting copious amounts of files on a daily basis, you shouldn’t have to defragment your hard drive for a many years. (I have not defragged my personal computer in the six years that I’ve owned it, and it still performs fine – the difference is in a fast processor and maximum memory). The performance increase you gain by defragging your hard drive is very small, and it can take HOURS to defrag your drive. Your Hard Drive (HDD) is your computer’s filing cabinet. You can have as many files in your filing cabinet that you wish. The number of files in your cabinet does not slow down your computer. Your RAM (Random Access Memory) is your’ computer brain’s short term memory. The more RAM you have, the faster your computer can perform. If you have a computer question that you would like answered, please visit the Contact page and leave a message. We’ll be happy to answer your question!